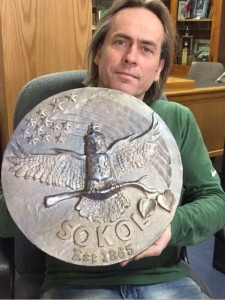 American Sokol commissioned Artist Alex Vesely to create this one of a kind plaque to commemorate 150 years of Sokol in America. It is 13 inches in diameter and cast in hydro-stone with a metal coating. The falcon represents the Czech and Slovak Sokols who came to America and formed our beloved organization. The falcon is wearing both the Czech lion and Slovak cross symbolizing from where Sokol originated. 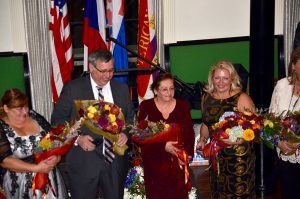 The lipa tree branch has 2 leaves representing the life of Sokol here in America and Abroad. The missing leaf represents those that have passed, but also new life of Sokol yet to grow. There will only be 250 plaques made, numbered and signed by the Artist. This is a perfect gift for any Sokol organization or member. About the Artist: Alex Vesely, born in the Czech Republic, learned to work with tools and materials in his fathers shop often making his own toys and furniture. He studied at Palette and Chisel Academy and has created many sculptures and artwork, his largest piece being a 30 gallon casting. He now works mostly with wood, metal, stone, clay and fiber optics. 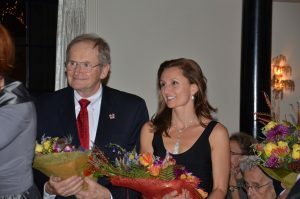 Most of his artwork is in private collections in US and Europe. His art studio is in Chicago. 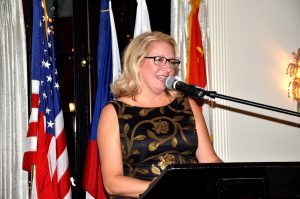 Alex’ sister, Jitka, was the curator of the Czechoslovak Heritage Museum when the national office was in Oak Brook IL and was a contributor to our Sokol Archive displays. 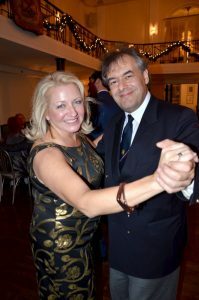 American Sokol Needs your support! Your Support Has Kept Us Flipping for 150 Years!